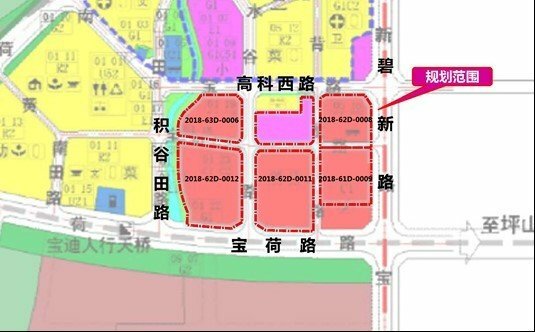 Shenzhen Nanyue Baina Commercial Land Project (hereinafter referred to as this project) has five sites, including 2018-63D-0006, 2018-62D-0012, 2018-62D-0008, 2018-62D-0011 and 2018-61D-0009. 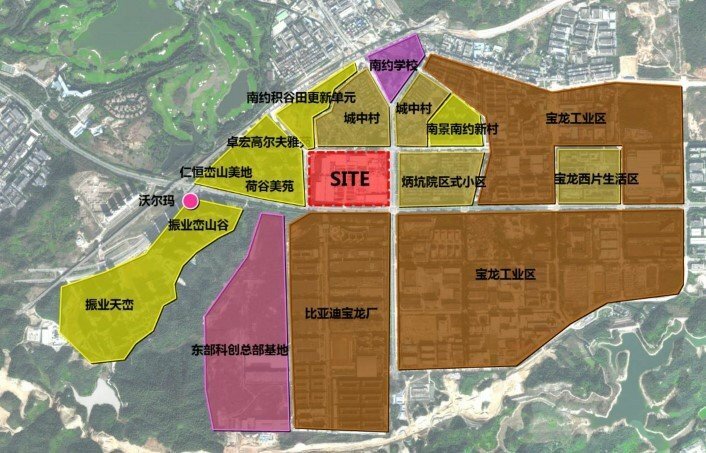 The project is located in the east of Longgang, Shenzhen City and the west of Baolong High-tech Park. Located in the northwest corner of Baohe Road and Bixin Road, the project is close to Longgang Central Science Park and has a superior location. The East and South sides of the land are dominated by industrial functions, and the West side is dominated by residential functions. Most of them are new houses and the north side is an old village. The overall positioning of the project is a comprehensive business support center and leisure and entertainment center. 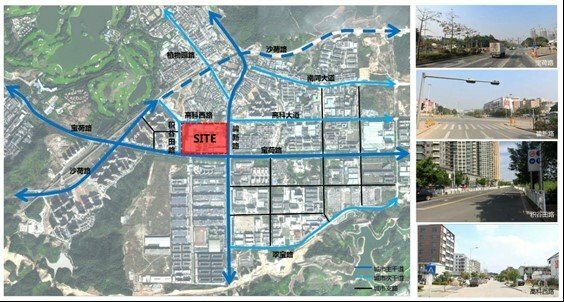 The south and east sides of the project are the main urban roads, namely Baohe Road and Bixin Road. The West side is Jigutian Road and the north side is Gaoke West Road. At the same time, the southeast corner of the project is Baohe Station, a three-rail interchange station. Recently, the Subway Line 14 station is directly connected to the project. Two subway connection channels are planned to connect 2018-62D-0011 and 2018-61D-0009 respectively. The overall traffic situation of the project is superior. The total land area planned for the project is 85, 300 square meters. The total construction area of the project development and construction land is 466,645 square meters, with a capacity of 5.47 square meters. It has 73,348 square meters for business, 233,797 square meters for office, 11,000 square meters for hotels, 127,843 square meters for business apartments, 13,347 square meters for talent apartments, and 7210 square meters for public facilities. The public facilities include 3200 square meters for the first stop of public transportation, 2500 square meters for substation, and 150 square meters for postal offices, community health service center 1000 square meters, community management room 250 square meters, recycling resource recycling station 60 square meters, community police room 50 square meters. In addition, this project includes 33,200 square meters of underground non-capacity business, located in 2018-62D-0008, 2018-62D-0011, 2018-61D-0009. Planning and architectural design of five plots, including 2018-63D-0006, 2018-62D-0012, 2018-62D-0008, 2018-62D-0011 and 2018-61D-0009. The design company must have the qualification level of the Grade A Design Institute, and the design company must provide a copy of the company’s business license and qualification document with an official seal. Both domestic and foreign design companies can apply for registration. Individuals and individual combinations are not accepted. The designers participating in the bidding activity shall be the registered personnel of the design companies. The chief designer responsible for the project must directly participate in the entire design process. At the consultation and communication stage, the organizer will provide a reply as soon as possible and will reply to all the questions in 1 working day before the registration deadline. The first name is the winning bidder. The winning bidder obtains the project design contract. The contract amount is based on the final design contract. The second place receives RMB 400,000 yuan compensation and the third place receives RMB 300,000 yuan compensation. The compensation will be paid within 20 working days of the completion of the bidding exercise. All the expenses incurred in participating in this tender, including design fees, compensation, etc. and all the taxes incurred by the tenderer are paid by the tenderer. If you want to know more about the participation method and detailed information, please feel free to contact us and we will reply to you in 24h. Aimir CG would be glad to inform you of all kinds of design events and help you address the challenges of taking part in these competitions and contests. Do not worry. The consultation would be completely free.